Note: the best because I have lots of project artifacts including a T&D Path, a set of client produced videos including me introducing the Keystone Event of the Path – NS 1251: Product Management Process Training – Basic Skills (8-days), plus documents from the Analysis and Design efforts, and some of the actual Instructional materials for both self-paced readings (print) and group-paced classroom (slides and exercise materials including a game board. And I have articles published by the client in their in-house communications materials. Here – below – is Module 1 on that Path: an 11:36 minute:second Video that was accompanied by a Planning Guide Binder – one for each supervisor for the 1100 target audience members – to help them plan/down-select from the entire Path. The video explains it all. It was step one in the Advanced Organizer – using blended media – to establish a common mental model (or two, three) so everyone could hang their hats – what they already knew into or onto this new scheme/framework. Then they would be able to explore the other areas of the model. What had been clear from the analysis was that there were probably almost 1100 unique jobs across the 1100 in the target audience. The 8 functions of the PM model represented the totality of what they and/or their entire organizations were doing – performance-wise – somewhere, somehow. Each PM typically had a unique slice of the pie. This seemed very typical of the time for large organizations that had evolved and never stepped back to re-engineer their processes and their organizations and jobs. That’s what this series of projects, CAD and MCD, that I was involved with – from 1986 though 1994 was caught up in with the client organization as it went through tremendos changes. Here – below – is a 9:20 minute video clip of me in the “last” Module in that first group on the Path’s far-left – explaining the first block – the 1000 Series (see the Path above) of the Curriculum Architecture to one of the classes in 1989. Most of the NS 1251 session’s participants had not done what could have been pre-requisites as the roll-out/implementation of the Curriculum had been uneven due to many organizational changes going on – while we helped prepare them for their changed/changing future. I have lots of video from that and other sessions – some/most of it actually transferred off of the VHS Tapes (remember those?) and have been converted into digital/editable forms hidden below the desktop. 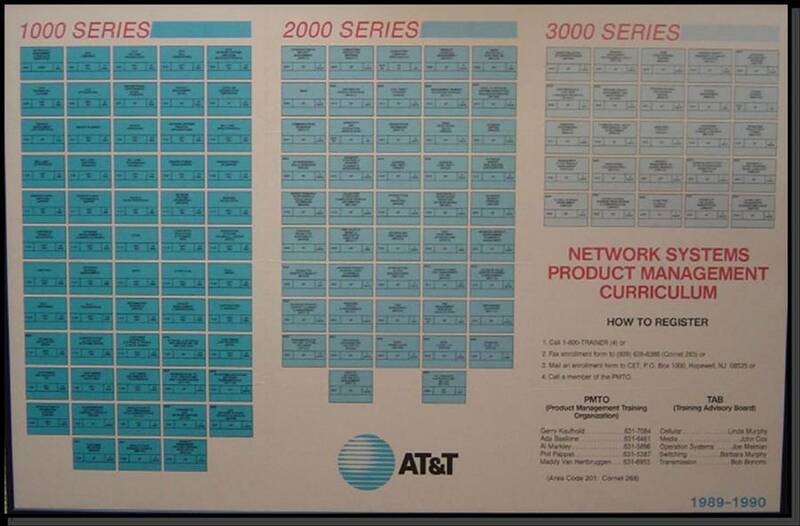 Here is an article published by the client organization – Network Systems – a division within AT&T – the manufacturing arm (the old Western Electric). The model on that cover page was also a key part of the advanced organizer (again refer to that first video above – which starts that organization of the Learner’s thinking – which we knew had a unique mental model for their jobs as the organization had never provided a common one). 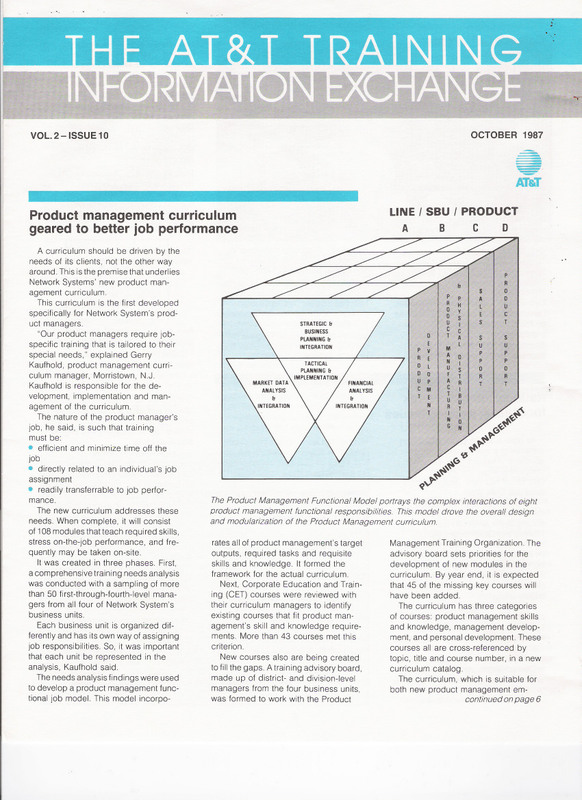 Here is an article published by the Chicago Chapter of NSPI (now ISPI) in 1990 that overviewed the “Key Advanced Organizer” for the entire Curriculum Architecture – a 100 or-so page, mostly true but always fictitious, novel about “a year in the life” of three Product Managers/Planners. I had hired Mark Bade to write this novel based on my outline – approved by the client and our Training Advisory Board (TAB) with a high-level executive from each of the 5 Business Units of Network Systems. They were somewhat skeptical at first about a 100 page Novel – but after it was released they saw what I had felt during the analysis: the need for some explanation about how it all worked. How all of the pieces fit together. Not only were he functional aspects of the PM job complex, their position in the life cycle changed or drove the things that they were going to need to plan on getting done – using their team – with no real authority over anyone. Yikes. 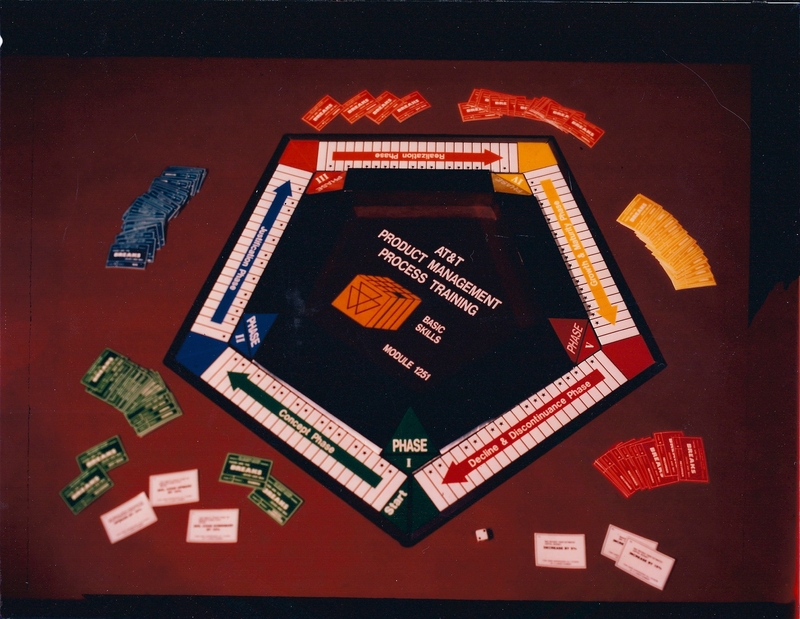 The Simulation Exercise – involved 5 rounds (see the sides of the board game) where each person would be part of a 2-3 person team and would manage one product through the 5 stages of the life cycle. They would each take turns planning for and then conducting a Product Team Meeting where they would be the PMs and others would role-play being Bells Labs, Manufacturing, Sales, and Support team members. Then they would update their plan – consistent with what happened in the meeting – even if what happened would result in a terrible plan (financials, etc.). They would deal with many issues typical to the Phase of the Life Cycle across the 5 Product Team Meetings – and would experience quite a bit in the 25 meetings for the 5 Products in the 5 Life Cycle Phases. The Simulation Exercises were everyone’s favorite part of the 8-day session. Almost 5 of those 8 days were spent in the exercises. Here – NS 1251: Product Management Process Training, an eight-day keystone course in an overall curriculum of more than 120 potential T&D Events…a modular design of performance-based instruction AND information…it’s the blue box at the end of the column on the left…the 1000 Series. 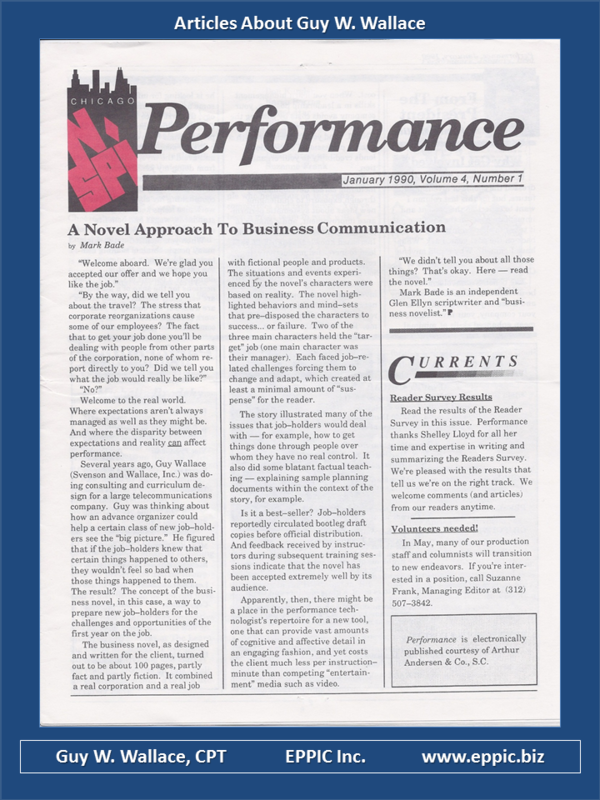 This project won an International Society for Performance Improvement (ISPI) Award of Excellence – in 1989/90.